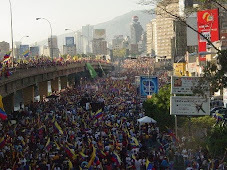 Venezuela News And Views: Chavez to people going to opposition run hospitals: drop dead! It surprise me such a sentence from Chávez after all. Something is wrong with him after the Santa Marta resigns. To say what he say is out of any law or political tactics. Very seldom. El centro de salud ha sido prometido en innumerables ocasiones por la alcaldía de Sucre, pero esta vez las obras han sido asumidas por el Ministerio de Salud. Han habido problemas por una corriente de agua que afectó el terreno. El hospital Pérez de León no se remodelaba desde 1956. I agree with you that he lost his mental health. It is also a threat with what he was saying. The message was for me also. You must not vote against me. He also violate the human rights. Every civilian has the right for medical help. If this is one thing what Fidel was saying to him, What are the other things? It was so disgusting and it was making me really mad. And I am not even a Venezuelan, but I was pissed off. This is the clip and for me he act like a mono. See the non verbale expression and the passion of destruction when he speaks. Will soon to be Latin America Killing Field? Thanks for the music video, Daniel. That one brought back memories! A truly sad day for Venezuelan Entertainment! All died the same day. The passing of an era, eh?